The DCF Songbook “From the Beginning” (Da Capo) provides an introduction to music for young children. It is suitable for junior classes in Primary schools. It is intended as a handbook for the children themselves. 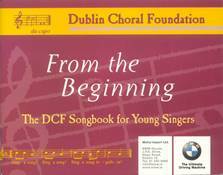 The DCF Songbook “From the Beginning” is new in that it combines song singing with the teaching of music theory. The texts of many of the songs teach aspects of music including note values, time signatures, key signatures and music terminology. An exciting new resource for students and teachers! The second DCF Songbook “A Step Ahead” provides an introduction to music for young children. It is suitable for 3rd – 5th classes in Primary schools. It is intended as a handbook for the children themselves. 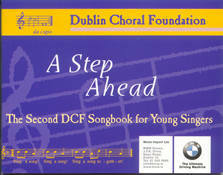 The DCF Songbook “A Step Ahead” combines song singing with the teaching of music theory. The texts of many of the songs teach aspects of music including note values, time signatures, key signatures and music terminology. Suitable for up to Grade 2 Associated Board standard! 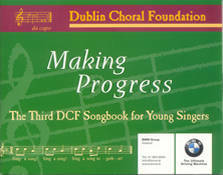 The third DCF Songbook “Making Progress” has been produced by Dublin Choral Foundation as part of its Music Education Programme. Like its companion volumes, “From the Beginning” and “A Step Ahead”, it combines song singing with the teaching of music theory. It is intended as a handbook for the children themselves. The DCF Songbook “Making Progress” presents a wide range of songs suitable for class singing and for teaching many aspects of music notation. Up to Grade 4 Associated Board standard. Another exciting new resource for students and teachers!